Red alert, my fellow Geeks! This is not a drill! The exhibit I’ve been waiting for since October has finally beamed down to the Children’s Museum of Indianapolis, and while it officially opens to the public tomorrow, I was able to attend a preview event for it last night! First, a disclaimer: The event last night was a preview event for local media, social media types, and Geeky influencers, so we were given complimentary access to the exhibit and the accompanying multimedia presentation in the theater. You’ve seen the info I’ve posted up leading to this, though, so you know how very psyched I was to see it, and now am to talk about it. The “it” I’m talking about? 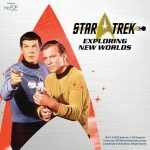 Star Trek: Exploring New Worlds! First off, what is the exhibit? Well, it initially ran at the Museum of Pop Culture in Seattle, WA from May of 2016 to May of 2018. 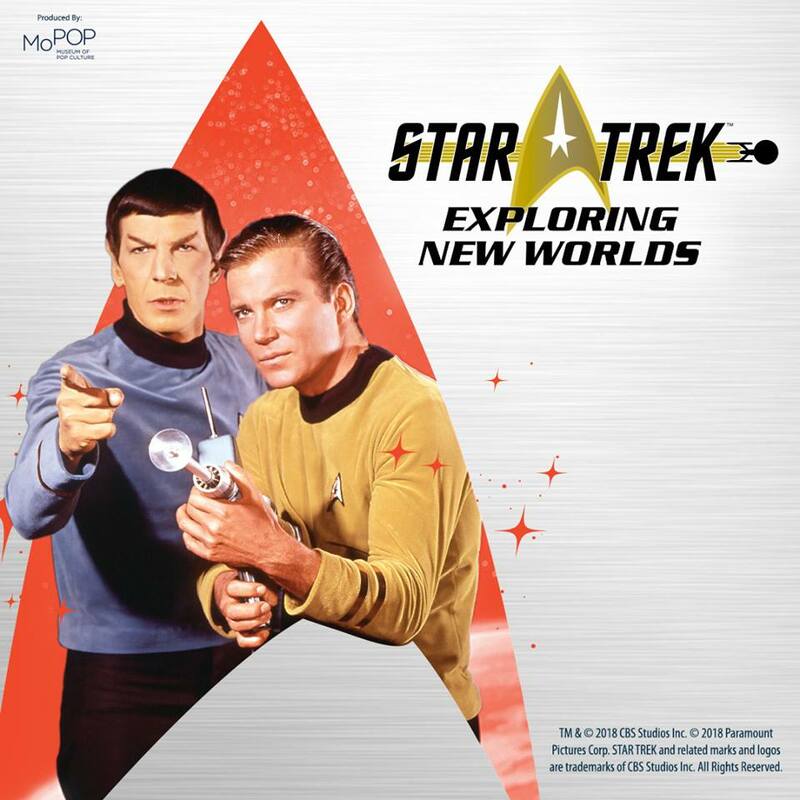 It opened for the fiftieth anniversary of Star Trek, and it chronicled the show, it’s cultural impact, and how it has been inspiring to so many people over the course of so many series and movies. It features a ton of artifacts from the television series and all of the movies, including the Kelvin timeline films (recent films). 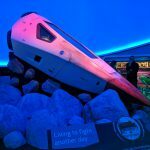 So, after the exhibit closed in 2018, it got prepped for a life as a travelling exhibit, and the exhibit’s first stop is here in Indianapolis, at The Children’s Museum! Now, what does the main exhibit have? It has so much, my friends! Walking into the entryway, you’re greeted by one of the large models of the Enterprise NCC-1701-D, from Star Trek: The Next Generation. It’s surrounded by items like pages from the script of “The Cage” (the first pilot episode of Star Trek), a model of the original bridge set, and items from Gene Roddenberry, the show’s creator. Then when you walk in to the exhibit itself, it’s a Trekkie’s dream. There are shooting models of starships, costumes from all of the series, including uniforms from most, hand props, set pieces, all mixed in with interactive exhibits. They have a stage where you can beam down to a planet and act out scenes, a “KHAN!” booth, an episode generator, and more mixed in with all of the pieces. In addition, they have a section about Star Trek and how it’s influenced culture, with examples and a video. It is a fantastic exhibit, with a wonderful centerpiece that includes original costumes and the helm/nav console from the original series! However, that’s not all of the Star Trek currently in the museum! In addition to the exhibit, they have a new show down in the Schaefer Planetarium and Space Object Theater! The Future is Here – How Sci-fi Becomes Reality is a fun show hosted by George Takei. It looks at how various science fiction shows now have real-world counterparts to their fantastic props and ideas, like how flip phones draw a comparison to communicators from Star Trek, or how a Roomba is kinda like Rosie from The Jetsons. This is all shown with a fantastic centerpiece that previously has only been seen on screen in Star Trek Beyond, and on display at a HP Discover conference in Las Vegas in 2016, a Kelvin Pod! This large-scale set piece is set in the middle of the theater, and it’s just awesome! Also on display in the theater are replica models of various starships, the filming model of the planet Excalbia from the original series episode “The Savage Curtain” (no space Lincoln to be seen), and displays of props next to their real-world counterparts. If all of THAT isn’t cool, then the entrance also has costumes from the recent Star Trek films, including Spock’s parka from the 2009 Star Trek, Kirk’s uniform and space suit from Star Trek Into Darkness, and outfits worn by background characters on the Yorktown from Star Trek Beyond! I’m going to be honest that I’ve been psyched for this exhibit for going on four months. I’ve watched the YouTube videos about the original exhibit, I’ve read blog posts about it, and I’ve been eagerly watching the social media feeds from The Children’s Museum as they’ve been setting things up. As usual, I was more overwhelmed by the variety of items I was able to see, and kinda glossed over. Though, I did try the “KHAN!” booth, and Rachel from The Five-ish Fangirls DID get it on their Facebook Live video (link to their Facebook Page). I did get a lot of shots of costumes, props, and models that I’ll be slowly uploading to the Facebook Page for the blog (link) over the weekend, and there’s a couple of Live videos (portrait mode, though. Sorry, I’m a newb at that!) including video of THE USS EXCELSIOR!!! In all seriousness, I’m hoping to hit the Children’s Museum a few more times between now and the first week of April, when the exhibit packs up and moves on to its next location. It doesn’t cost any extra, and it’s right next to the Pop Culture exhibit, which makes an excellent neighbor. If you have any interest in Star Trek at all, you have got to go. Here’s what you need to know, and underneath is a photo gallery to give you a taste of what’s going up on the Facebook Page this weekend!